May the Lord help us and our readers be ready! I’ll highlight this on the Christian Poets & Writers blog – http://christianpoetsandwriters.blogspot.com. God bless. 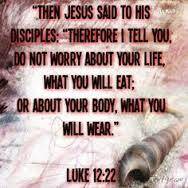 Worry is second nature to most of; turning our fears and worries over to God–no so easy. It’s like we want Him to fix the problem, but we don’t want to let go.